Newsletter GeOnG - more info on the evening events, 2 days left to register! ONLY 2 MORE DAYS TO REGISTER! You can discover on our website the speakers and abstracts of the 8 roundtables, 23 workshops as well as more information about the speedgeeking, lightning talks, fail fest, and evening events. The 2018 GeOnG forum starts in less than a week! Save your seat by registering now: the deadline to get your ticket is Thursday 25/10 at midnight. In order to improve your experience as a participant, we are kindly asking you to also sign up to the workshops and roundtables you'd like to attend before the conference, so we can better plan ahead all logistical aspects. Please keep in mind that you can sign up to up to 3 roundtables and to up to 5 workshops (3 on Monday & Tuesday, and 2 on Wednesday). This will allow us to guarantee you'll participate to the sessions of your choice. Signing up for plenaries & short sessions - fail fest, speedgeeking and lightning talks - is not required. 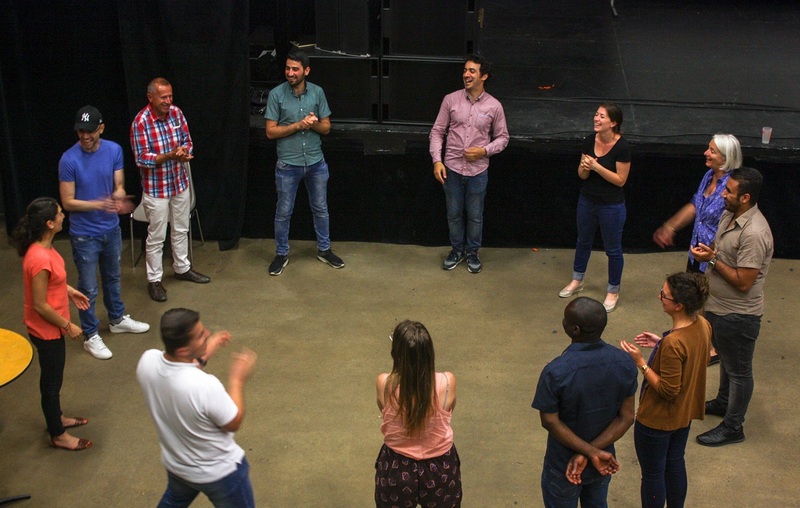 AFD INVITES YOU TO TAKE PART IN A COLLABORATIVE CHALLENGE! Ready for the ultimate GeOnG challenge? From emergency to development: bridging the information gap! On Monday evening, the French Development Agency (AFD) is inviting you all take part in a collaborative challenge! Come and join us for an evening of creative activities and group challenges around the theme of data sharing between the humanitarian and development sectors, and help us gather a series of recommendations to bridge the information gap between the two sectors! The evening will be facilitated by Maeve de France and Martin Noblecourt from the CartONG team, with the support of friendly experts on technologies and data sharing standards, open data tools and initiatives, and also, representatives from AFD and H2H organizations. They will help you navigate the evening and take on the challenge. No need to bring your computer or tablet! Just bring your thinking cap, some friendly competitiveness, a solid appetite (yes, there’ll be a buffet!) and a bucket of good mood, and meet us at 6:30pm on the 1st floor! CartONG wishes to promote its project EducAuRA, objective 2030 - implemented as part of the European programme "Frame, Voice, Report!" - which aims at raising awareness about the Sustainable Development Goals amongst the citizens of Auvergne-Rhône-Alpes - a theme often encounters in mainstream news coverage yet not well-known and understood by the general public. 17h30 - 19h30 - "Maps of the future" : CartONG invite you for a sensitive mapping session - a subjective and creative approach of mapping. The workshop will be led by CartONG and aims to question the participants about their understanding of sustainable development giving them the opportunity to express their vision of our future world through drawing. The workshop will be ran in French but live translation will be provided by our volunteers for those interested. 20h00 - 21h30 - Conference-debate "Interwoven stories on measuring progress towards the Sustainable Development Goals" (in French): a panel of experts will debate and share their experience about measuring progress towards the sustainable development goals, focusing on the ODD 6 “Clean water and sanitation”. During the GeOnG, you'll be able to meet AFD representatives during the Plenary session and at their stand. On Tuesday 30/10, AFD will lead a workshop on "GeoPoppy, a low-cost portable web-GIS server for offline geographic data collection", with the support of Nitidæ, CartONG & Julien Ancelin (INRA), the creator of GeoPoppy. You are also invited to participate in the collaborative evening event on data sharing hosted by AFD on Monday 29/10 and to take part to the conference-debate on How to track and measure Sustainable Development Goals on Tuesday 30/10. As part of GeOnG, ESRI will facilitate its own workshop "Integrated GIS to support field operations" - featuring technologies such as Survey123 for ArcGIS, Collector for ArcGIS, Operations Dashboard for ArcGIS, etc. - on Monday 29/10. You can also meet them at their stand during the GeOnG. 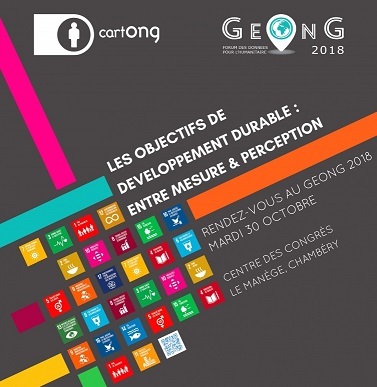 As part of the GeOnG, Novel-T will lead a speedgeeking session on the theme of optimizing vaccination campaigns through geospatial analysis on Tuesday 30/10. You can also meet them at their stand during the GeOnG. As part of GeOnG, Gnuccop will lead a workshop on DEWCO, a data collection and visualization tool, as well as a speedgeeking about Yago, a GIS platform for natural disaster risk reduction, on Tuesday 30/10. You can also meet them on their stand during the GeOnG. We also thank our Silver partners: Aptivate, CamptoCamp, Cybis project, Geo212, Magellium, Mangologic, Mapbox, Picterra & RSM, as well as the City of Chambéry, and Geodesk who sponsors the travel of the Kathmandu Living Labs.